Babywearing has been the savior for many new mothers and choosing the best baby carrier for your needs is a must. Tackling motherhood, while caring for your spouse, home, pets, other children, and for many moms, a full-time job, can be very challenging. I was completely hooked on babywearing with my first son because it allowed me to go back to work just 2 weeks after having him. The joys of self-employment. I have no idea how I would have managed without babywearing. Babywearing freed up my hands to do other tasks but kept my newborn safe and close to me. I can’t advocate enough for babywearing! Keep your baby secure and comfy while getting all the things done. The most difficult task was choosing the right carrier. Today we are sharing our picks for the 5 best baby carriers for newborns. Before we get into the reviews, it is important to talk about what babywearing is, what a baby carrier is, and discuss the different types of carriers, because there are several different types. Babywearing is the practice of keeping your baby close to you by wearing your baby on your body using a sling, wrap or other types of carriers. Parents have been babywearing for centuries, and many people associate babywearing with attachment parenting. While babywearing is a part of the attachment parenting style, you don’t need to be into attachment parenting to benefit from babywearing. Babywearing provides mom with the freedom to multi-task and your baby feels more secure because they can see, smell and hear you. A baby carrier is either a piece of stretchy fabric or a sturdy structured carrier with straps that you wear to carry your baby close to your body. The carrier should be ergonomically correct and not hurt your back, neck, or shoulders. It should be comfortable for you to wear and move around freely. You may need to try several types of carriers before you find the right one for you. There are several types of baby carriers: including wraps, slings, soft structured carriers, Mei-Tai, and backpack type carriers. So many choices available! It can be hard to know which one is right for you, let’s look at the 5 main types of baby carriers. A long piece of stretchy fabric you wrap and tie around your body to snuggly hold your baby. Wraps take practice to learn how to tie properly, but they are my favorite for babywearing while shopping or working in my home office. A piece of stretchy fabric with rings on one end. The long piece of fabric is threaded through the rings and you adjust it to fit your body type. Soft structured carriers have a sturdier feel and lots of straps to help distribute your baby’s weight ergonomically. A great choice for parents looking for a more secure feeling and snug fit. Asian-style baby carrier with four straps. The two shorter straps tie around the waist and the longer straps wrap over the shoulders. Offer lots of structure and padding, great for toddlers and parents who like to hike or travel a lot. 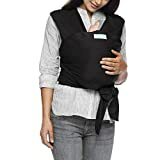 You want to be sure your baby carrier holds your baby securely and close to your body, be sure it has a wide base strap and a wide seat for your baby. Your baby carrier should be comfortable to wear for long periods. It should not hurt your shoulder, back or neck. Look for carriers that are ergonomic with padded straps, adjustable straps for different body types. A baby carrier that is easy to care for is the best choice. Look for carriers that are machine washable and dryer safe. Choose a baby carrier that is easy for you to use. There are several different types of carriers. Maybe you don’t have time to tie a wrap, the learning curve can be somewhat difficult. Maybe a soft structured carrier is the better choice for you. Ease of use and safety should be your top priority when choosing a baby carrier. Baby carriers range in price from $30 to $250. Consider your budget and how long you plan to use a carrier before buying. The most expensive isn’t always the best in terms of quality or comfort so keep that in mind. This one-size-fits-all Boba Baby Carrier has withstood the test of time and it is only getting better. No wonder it has a lifetime guarantee. Made of machine washable French Terry blend and ties easily to make your life easier. Spandex helps maintain its shape so you can wear your baby all day long. Breastfeeding? Not a problem, discreet and comfortable. If you need help getting started to check out the Boba Nursing YouTube videos. * The reviews for this wrap are overwhelmingly positive. As with many clothing accessories, it comes down to how it fits mother and child and how it functions based on one’s daily routine. The Infantino Flip 4-in-1 Convertible Carrier is the perfect choice for parents looking for an affordable and comfortable soft structured carrier. This baby carrier holds infants and babies from 8-32 pounds. The Infantino baby carrier is a 4-way convertible carrier offering facing-in with a narrow seat for newborns, a facing-in wide seat for older babies, front-facing narrow seat, and back carry for older babies and toddlers. The carrier offers an ergonomic seat that helps ensure correct baby hip positioning. The carrier has a wonderful cover bib that helps protect clothing and the carrier from baby drool and spit-up. Parents will find this a lightweight and comfortable carrier to wear for long periods. It has extras padding in the shoulders, adjustable waist belt which help to distribute the weight of your baby. The Moby Wrap Baby Carrier is an affordable choice for parents looking for a buckle free wrap baby carrier. The carrier holds babies from 8 to 35 pounds. Unlike other carriers, with narrow bands that go through one shoulder, the Moby Wrap is a broad piece of fabric that covers both shoulders. It is simple to adjust the Moby Wrap to fit your baby comfortably. How well it will work for you, will depend on how tight you wrap yourself and your infant. The Moby Carrier comes with a well-explained training guide. With the stretch cotton and also the size of the Moby Carrier, your infant is wrapped close and tight, guaranteeing a safe and secure fit. You can wear your Moby Wrap with your baby facing you, facing the world, sideways, or on your back. When not being used as a carrier, the Moby Wrap can be used as a blanket, pillow, a support, or for breastfeeding. It is easily machine washable and 100% cotton. The most common problem reported is difficulty learning how to put the wrap on. Seeing this is an inherent problem with most of the wraps if you choose to use a wrap there is a learning curve is involved. Easily fits 8 – 35 lb baby. Made of hand-woven cotton which breathes well, is cooler than spandex Also not as long so less wrapping. Can wear baby many ways and on the hip for heavier babies. Easier to put on than the wrap style carrier. This can be much more convenient when transferring baby. Small enough to fit in your diaper bag and has a zippered pocket for essentials. Additional material that can be used to cover for breastfeeding. Safety tested aluminum up to 250 pounds and passes safety standards established by CPSC and ASTM. The Aluminum Rings are made in the USA by Sling Rings of aircraft grade aluminum, tested to 250 pounds. Easy to care for, just machine wash in cold water and line dry. Comes with a !00% Satisfaction Guarantee. The Baby K’tan – ORIGINAL Cotton Wrap style Baby Carrier is a good choice for parents who want the look and comfort of a wrap carrier without the time-intensive “wrapping” issues. It is ready-to-wear straight out of the box. This baby carrier holds babies from birth through 35 pounds and offers hands-free, buckle free babywearing. The Baby K’tan is an affordable baby carrier that would make a great baby shower gift for an expectant mom. The baby carrier comes in a variety of sizes from XXS-XL and you should choose your pre-pregnancy size. The carrier slips on like a t-shirt and offers 5 different ways to wear your baby. It is lightweight, ergonomic, machine washable and dryer safe. Allows for discreet breastfeeding, holds your baby securely and snuggle close to your body for increased bonding. Choosing the best baby carrier is not about cost. It is about knowing your baby is comfortable and secure. You will be using your carrier a lot so make sure it suits your personal needs as well. Comfortable, cool, easy to wear and transfer your baby and least limiting in terms of mobility.